At a congregational meeting held on Sunday June 12, 2011 the members of RPC agreed unanimously to extend a call to the Rev. J Wesley Denyer who was, at that time, minister at St. Andrew’s Church Brampton. Subsequent approval was obtained from the two Presbyteries involved and Wes’ first Sunday in the pulpit at RPC was on September 11 with the formal Service of Induction taking place on September 18. After graduation from Knox College, Wes was appointed to St. Andrew’s, Kirkland Lake where he served for four years beginning in 1984. In 1988, he was called to Unionville Presbyterian Church, a church extension charge. During his time in Unionville, the congregation constructed their first church building and grew in size from 70 to 230 members. In 2000, Wes was called to St. Andrew’s Presbyterian Church – a 650 member congregation in Brampton’s old historic downtown core. During his ministry, the congregation has welcomed 350 new members, developed the adult Christian Education programme, accomplished almost one million dollars of restoration and renovation work to the church building and infrastructure, and the St. Andrew’s Food Bank has grown to become the congregation’s central mission activity as it distributes 10,000 packages of food each year. 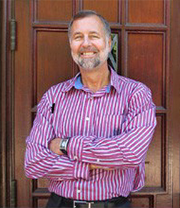 Wes has served at various levels of church government within the Presbyterian Church in Canada. At the presbytery level, he has served as Clerk, Moderator and Convenor of the Ministry Committee. At the national level, he has served as Convenor for the New Church Development Committee, the Stewards by Design National Organization Team and the Emmaus Project National Design Team. Wes has also served on the Stewardship Advisory Committee, the Knox College Board of Directors and Development Committee, and Assembly Council. As a leadership style, Wes believes in the importance of a collaborative model of ministry, and congregational participation and transparency in decision making. Wes values excellence in worship and music, both in traditional and contemporary styles. Wes enjoys scuba diving, long walks, weight training, reading and movies. Wes is married to the Reverend Canon Dr. Judy Rois who serves as Executive Director of the Anglican Foundation of Canada. Wes has two children. His daughter Laurie is married to Graham Denyer Willis. Laurie is a research fellow at the London School of Hygiene and Tropical Medicine. His son Paul and his wife Julia live in Calgary, where Paul is a plumber. Wes has three grandchildren. His daughter is the mother of Arden, who was born in October of 2010 and Jude, who was born in January of 2014. His son Paul is the father of Emma, who was born in August of 2018. We were one of the first Presbyterian Churches in Canada to have a repeat: Rev. J.B. Paulin served for six years, then returned a decade later for another 15 years! And then, we did it again with James Smart! J. Wesley Denyer (Wes) became our minister in 2011.